Ever had so much to do and so much to handle that you wished you had some time for yourself just once? I’ve been there. Everyone with any sort of serious responsibility – be it your business, your job, your children, your family – have faced the issue of oh I feel trapped in a rut and I have no time at all. Well I bring to you the holy grail to free up time, all the while making more money and reducing stress. 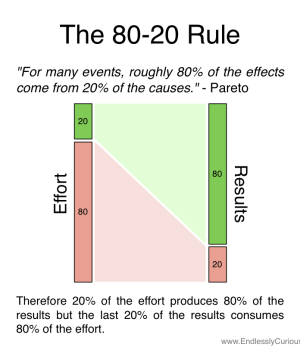 Named after the economist Vilfredo Pareto, the pareto principle, also known as the 80/20 rule, the law of the vital few is an observation that roughly 80% of the effects come from 20% of the causes. 20% of the richest hold 80% of the world’s wealth. 20% of the products create 80% of the profits. 20% of all customers account for 80% of the revenue. 20% of your friends cause 80% of the drama and problems. 20% of stocks create 80% of the returns. 20% of the team does 80% of the work in any group project. You get the point. Sure, the 80/20 may be a generalization, and depending on the situation, it might look more like 70/30, and in some extreme cases 99/1. 1% of all internet users create 99% of the content. 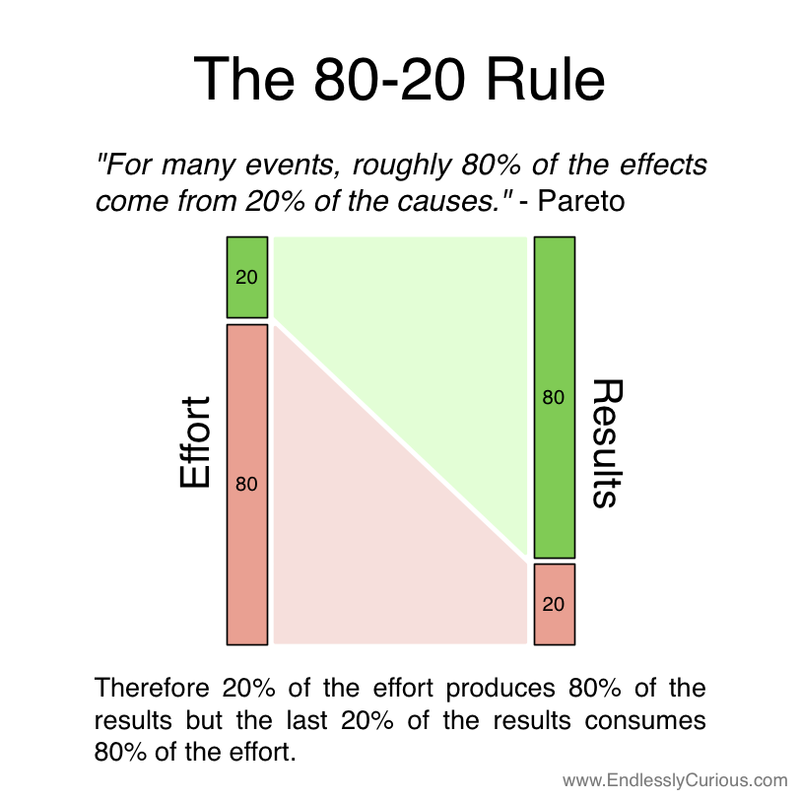 Fix the 20% that causes 80% of the bad things. Feed the 20% that brings 80% of the good things. Make a list of all your friends and people you spend time with. Circle the 20% whom you consider useful to be friends with – the go-getters, the people who will be there for you, the people who want you to improve. 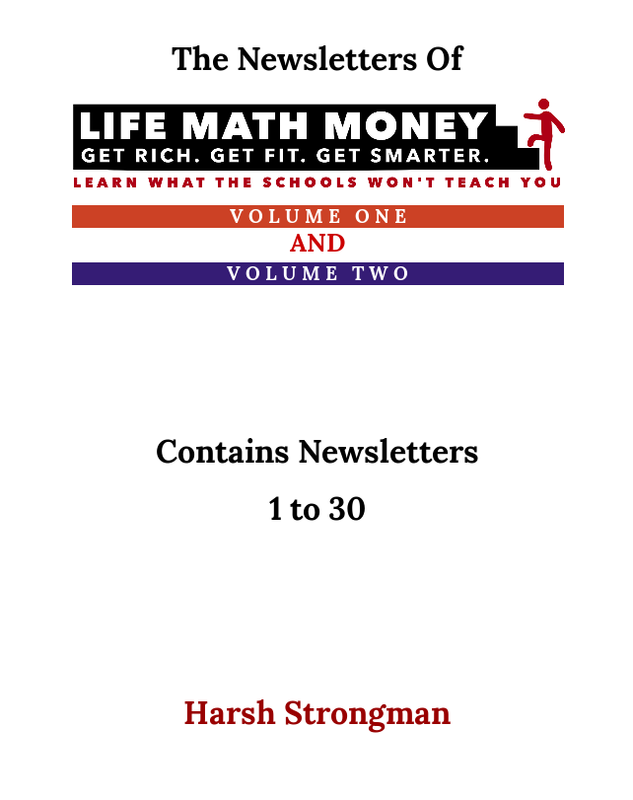 Mark the 20% you consider repulsive – the no-getters, the drama queens, the toxic haters, the people who will betray you every chance they get, the people who want you to stagnate. The Good 20%: Focus on improving your relationships with them. Be there for them. Help them progress too – share this article with them. The Bad 20%: Cut them off. You do not need them in your life. They are a liability. They are the haters. Do not pick up their phone. Do not reply to their texts. Delete their contact from your phone. The Neutral 60%: Spend time with them only if necessary. Demote them to an acquaintance. You can stay in touch with them occasionally – a phone call a few times a year will suffice. Every business has a few clients that bring in most of the revenue. 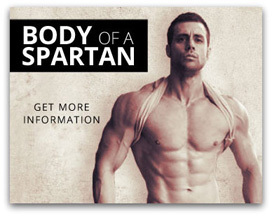 A similar 20/20/60 analysis will help you identify them. The Good 20%: Figure out how you can sell more to them. Think back how you acquired these clients – now you know where you need to focus your time and where the advertising $$$ needs to go. The Bad 20%: These people need to be dropped. I know it’s hard, but these clients will hurt your business in the long run. They take up too much time and bring in too little revenue. You would be better off spending the saved time hunting different clients and servicing your existing ones. The Neutral 60%: No need to spend too much of that advertising moolah here. Give them decent service, meet their expectations, but no need to go the extra mile. A similar analysis can be done for employees (whom to promote, whom to fire), for products (discontinue the bottom 20% and advertise the top 20%) and really anything else. This 80/20 rule applies to everything – and you would be wise to use and abuse it – for there’s only 24 hours in a day, and you’re wasting your finite limited time on things and people who don’t matter. The time you save has to be used wisely, to get the important things done and to catch up on the much needed rest.